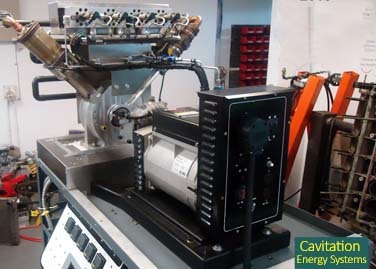 CCES, which is an acronym for Controlled Cavitation Energy System, has patented a new system for generating steam. The steam is produced by impacting clusters of water molecules at hypersonic velocities in a confined chamber. In our tests we have demsonstrated that we can produce steam using significantly less energy than that required during Rankine cycle thermal heating of water. Using a specially modified diesel injector, we were able to inject minute amounts of high-pressure droplets of water into the impact chamber. The impact shatters the water and effects an instantaneous phase transition causing an increase in temperature and pressure. In our test, we easily reached 2,000 psi with 15 injections 0.2 milliseconds apart of 0.3 ML of distilled water of hypersonic speed into a 3.2 cubic inch chamber. The total volume of water entering the chamber was less than 12%. Research on the power of high speed impact of water has been done by both the Israelis and the Japanese, but neither group considered the application towards steam generation.